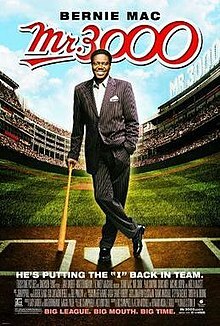 Mr. 3000 is a 2004 American sports comedy film starring Bernie Mac and Angela Bassett. The film's plot surrounds a retired Major League Baseball player who makes a comeback at age 47 in order to attain 3,000 hits. Stan Ross is the franchise player of the Milwaukee Brewers baseball team. After recording his 3,000th hit, the selfish, narcissistic Ross immediately retires, leaving the team without one of its star players in the middle of the 1995 playoff race, showing every bit of disregard for his teammates' feelings. During the next nine years, Ross uses his nickname as a business tool, owning several profitable properties under the name "Mr. 3000" that make him increasingly wealthy. In 2004, the Brewers retire Ross' number so they can get rid of Ross for good, and also draw a large crowd. Although many fans come to the ceremony, other players, including teammates and fellow stars Robin Yount, Cecil Cooper, and Paul Molitor, stay away. Only his best friend Anthony (Boca) Carter and a middle relief pitcher from his early days in the majors named Bill (Big Horse) Berelli attend, and the ex-pitcher chastises Ross for his arrogant attitude. Ross learns that, due to a clerical error, he retired with 2,997 hits instead of 3,000. The error also partially contributes to Ross not being voted into the Baseball Hall of Fame and makes his "Mr. 3000" marketing gimmick inaccurate. Ross seeks to return to the game at the age of 47 to get three more hits, secure his place in the record books, and keep his local post-career marketing gimmick intact. A top Brewers executive, citing the large attendance at Ross' number retirement ceremony and the fact that the Brewers are out of playoff contention, agrees to bring Ross back during the September roster expansion. The team's younger players only know of Ross as a self-centered player, and team superstar Rex "T-Rex" Pennebaker, who is pompous and arrogant like Ross, sees him as unneeded and too old to play. Manager Gus Panas refuses to speak to Ross because of his abrupt retirement, and the sportswriters continually criticize him. Despite his predictions to the contrary Ross struggles to regain his baseball form. He goes hitless in his first 27 at-bats. His comeback is reported by television sportscaster Maureen "Mo" Simmons, who resumes a former romantic relationship with Ross. He gets two hits, including a home run, to increase his career total to 2,999. Ross becomes a mentor to the younger players and urges Pennebaker to learn from his own mistakes as a baseball star and to be a team player, so that Pennebaker will not end up like him – all alone. This inspires the Brewers to a late-season comeback and a respectable finish. Ross attempts to become serious with Simmons and make her a permanent part of his life, but she is reluctant to believe he is a changed man, particularly after he skips a team practice to go on national television with Jay Leno and begin boasting again. In his last at-bat of the season, with a chance to be a hero, Ross has a vision of his earlier years, when he was considered always dependable for the team. It inspires him to sacrifice his last chance with a bunt instead so the team can win a game and finish third in its division. Although Ross never reaches the "3,000" milestone, his newfound generosity and attitude gets him inducted into the Hall of Fame. He renames his businesses "Mr. 2,999." Portions of the film were filmed at Marquette University High School, as well as Miller Park, in Milwaukee, Wisconsin, and at Zephyr Field in New Orleans, Louisiana. The film received mixed reviews, earning a score of 54% on Rotten Tomatoes which observed "Bernie Mac demonstrates he can play the game even if the movie's a few innings short of a complete game." The film took over $8 million at the box office on its opening weekend. In all it took $21,811,169 in the US and Canada, and a further $28,190 when it was released in Spain, for a global total of $21,839,377. ^ Voters have elected all eligible (Pete Rose is ineligible) players with 3,000 or more hits to the Hall of Fame, except for controversial player Rafael Palmeiro. ^ Harte, Stephanie. "MKE locations, scenery utilized in well-known films". Marquettewire.org. Retrieved August 17, 2017. ^ "Mr. 3000". Rotten Tomatoes. Retrieved July 15, 2013. ^ "Mr. 3000 (2004)". Box Office Mojo. December 23, 2004. Retrieved July 15, 2013. ^ "Mr. 3000 – Original Soundtrack – Songs, Reviews, Credits". AllMusic. Retrieved August 17, 2017.